Defense attorney Ronald W. Zdrojeski, center, makes opening statements to the jury, while plaintiffs' attorney Martin E. Levin, left, and Justice Raymond J. Brassard, right, listen during a civil trial. PLYMOUTH — A lawyer representing Mattapoisett property owners opened his case against Bouchard Transportation Co. on Tuesday by arguing that his clients lost the special privilege of swimming, strolling and sunbathing at their private beaches when a barge owned by the oil transport company negligently ran aground and spilled up to 98,000 gallons of oil into Buzzards Bay in April 2003. “That specialness came to a screeching halt when the defendant’s oil came ashore,” said Martin E. Levin of Stern, Shapiro, Weissberg & Garin LLP of Boston. Levin promised to show why Bouchard should compensate property owners for lost rental value, even if some of them never rented their homes. “It’s an objective way to measure that damage done by oil that should have never polluted those Mattapoisett shores,” he said. “We shouldn’t have to pay for damages that don’t exist or are exaggerated,” he said. Bouchard spent “upwards of $36 million” on a comprehensive cleanup of the Buzzards Bay shoreline that was overseen and approved by federal, state and local officials, Zdrojeski said. “We relentlessly and arduously went out and found where the oil was and we cleaned it up,” he said. None of the property owners was forced to leave their homes on account of the oil spill, Zdrojeski said. 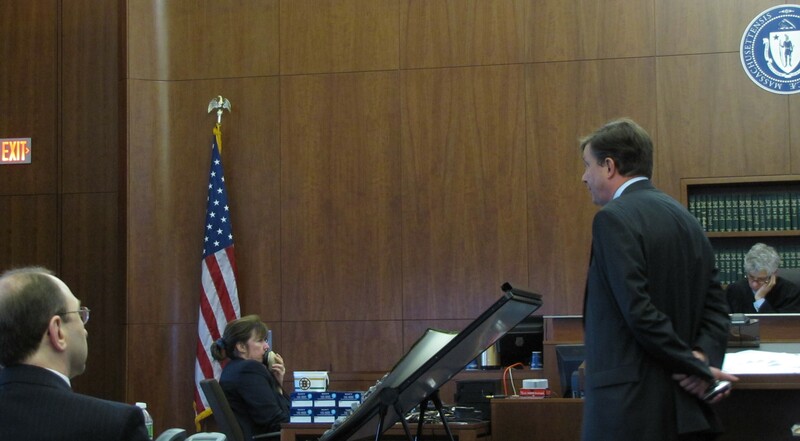 The lawyers’ opening statements launched the second day of civil trial proceedings at Plymouth County Superior Court. The trial is part of a class-action lawsuit filed against Bouchard by 1,100 Mattapoisett property owners who are seeking millions of dollars in damages related to thick fuel oil that leaked from the B. No. 120 barge after it drifted off course and ruptured its hull on submerged rocks identified in nautical charts. Both Bouchard and the mate of the Tug Evening Tide, which was pulling the barge, pleaded guilty to violating the Clean Water Act and killing 450 federally protected birds. Bouchard paid the federal government $9 million in fines, while mate Franklin Robert Hill served six months in federal prison. “Not everything they were seeing was oil,” he said. Levin shared an overhead slide featuring a Geographic Information System map developed from Bouchard data that depicted varying degrees of oil pollution along the Mattapoisett shoreline. “Some of the beaches were more heavily polluted than others, but all of the properties were contaminated with some of that oil,” he said. Following opening statements, prosecutors called four witnesses to testify before the jury. The witnesses included Erich Gundlach, a coastal earth scientist with E-Tech International Inc.; retired Mattapoisett Fire Chief Ronald Scott; Mark Maguire, a GIS development manager with Tetra Tech Inc.; and Bradford Chase, a Natick resident whose Mattapoisett property at 15 Seamarsh Way was contaminated by oil from the Bouchard spill.